A granuloma is an area of inflammation that occurs in tissues. These small, benign growths typically form as a result of the immune system blocking off foreign substances it can’t eliminate. Granulomas can also develop when the body attempts to heal any incisions or breaks in the skin, which is how pyogenic granulomas tend to develop. Sarcoidosis: This inflammatory disease affects different areas of the body, but is most common in the lungs and lymph nodes. 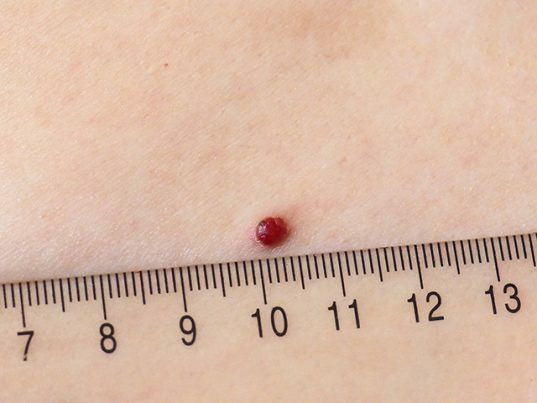 People with this condition will have small patches of reddish granulomas on any body part. Granulomas on the lungs can lead to pulmonary fibrosis, while granulomas on the heart can result in rhythm disturbances. Rheumatoid arthritis: Necrotizing granulomas can grow on the soft tissues around the joints or in the lungs. Tuberculosis: People who have tuberculosis are prone to both necrotizing and non-necrotizing granulomas in their lungs. In most cases, granulomas are more an aesthetic concern than anything else. Pyogenic granulomas are an example of this. According to Healthline.com, these are noncancerous growths that are prone to bleeding since they contain a considerable number of blood vessels. Beyond their tendency to bleed, pyogenic granulomas are harmless, for the most part. However, some granulomas can cause side effects, depending on the area of their growth and the underlying causes that encouraged their development in the first place. For instance, lung granulomas that occur due to sarcoidosis can lead to chest pains, wheezing, and coughing. Vocal cord granuloma (which are granulomas that grow on the back of the vocal cords) is characterized by a dry cough, hoarseness, difficulty or pain when speaking or swallowing, and sore throat. Though benign for the most part, certain granulomas can cause more severe complications. Calcified granulomas are granulomas that contain calcium deposits; they can be found in the lungs, liver, and spleen. When they grow on the liver because of schistosomiasis (a disease brought on by parasitic flatworms known as schistosomes), there’s a chance that the liver could eventually become fibrotic and scarred. Granulomas tend to be caused by underlying medical conditions, meaning that there’s no way to prevent them from growing directly. The best that can be done is to consume foods or nutrients that protect the body from these medical conditions. This usually entails eating a healthy and well-balanced diet that contains large quantities of fresh fruits and vegetables, moderate amounts of high-quality protein (e.g., eggs, beans, or lean beef), and substantial portions of healthy fats (e.g., avocados, chia seeds, or fatty fish). Granulomas that occur on the outside of the body can be removed via surgery or topical ointments or creams. Those that grow inside of the body can be extricated through surgery as well, or by a prescription that controls inflammation. However, granulomas don’t usually require treatment because of their benign nature. Moreover, doctors will usually work on treating the condition or infection that’s encouraging their growth in the first place. Granulomas are noncancerous growths that can appear on any soft tissues. They usually develop because of the immune system reacting to foreign pathogens but can be caused by medical conditions as well. Though uncommon, some granulomas have been known to lead to side effects and complications. Granulomas can be treated with oral medication, surgery, and topical ointments.